Tim Pavino: "I'm always being friendzoned." Tim Pavino can totally relate to his latest single. It's time for #ONEMUSICianOfTheWeek! Like in the previous weeks, this online column aims to give you a deeper look into music artists (of my random choice) and their current projects -- whether new single, album, music video, concert, or even not-so music-related stuff. Today, I've got one of the freshest faces in the local music scene, the guy behind the hit song "Good Vibes," Tim Pavino. Tim, who's turning 27 next month, is just among the living proofs to a saying, "You can never have everything," that despite his good looks and talent, he seems to experience heartbreaks too... like me and you. This is one good reason why he came up with a song "Pag Pwede Na Ang Puso Mo," his latest single from his debut album released under Star Music five months ago. 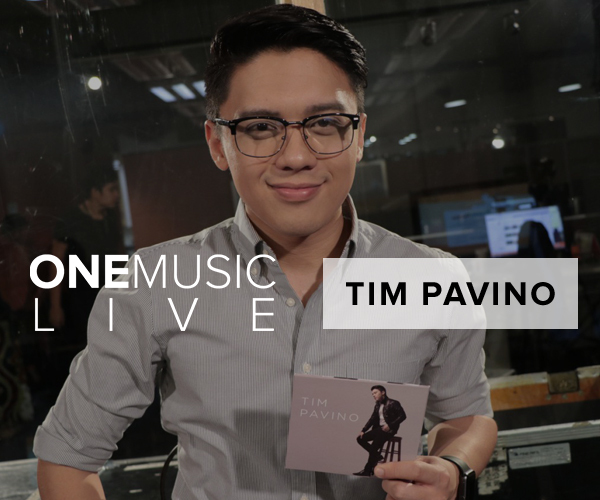 "It talks about being friendzoned," Tim shared in an exclusive interview right after his One Music Live Session held last Friday. Tim also told that the song can be an official theme song if his life will be featured in a teleserye or if he, himself, will star in a teleserye -- which remains one of his greatest dreams. "I would love to do teleserye if there will be an offer," he said. "I believe that doing teleseryes will help a person grow as an actor." But while there is no offer yet, Tim focuses on his major craft -- music. After the release of his 12-track debut album (plus five minus ones), the former The Voice of the Philippines contender, anytime soon, will start working for a new one. Tim hopes that in the next album, he will be able to do a collaboration with any male artist. "In the first one, I was so grateful I had collaborations with Morissette and Ms. Angeline Quinto. Looking forward naman ako sa collaboration with any male singer. Na-inspire kasi ako sa collab nina Sir Gary (Valenciano) and Jed (Madela), 'yung 'Hard Habit To Break,'" he shared. Tim also said he would love to try to experiment with a new sound but his listeners should always expect ballads. What do you think about Tim Pavino's "Pag Pwede Na Ang Puso Mo?" Comment below! #OneMusicLIVE with Bayang Barrios and the Naliyagan Band!